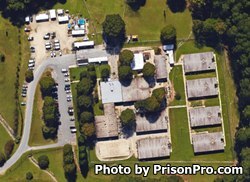 Wake Correctional Center is located in Raleigh North Carolina. It is a minimum custody correctional center that houses 414 adult male inmates. The majority of the inmates at this facility leave the prison during the day to report to a wage earning job, and return to the institution at the end of their shift. Additional work assignments within the prison include landscaping, custodial work, laundry, and food services. Wake Correctional Center offers vocational classes in HVAC, electrical wiring, horticulture, reading blueprints, and certified communication. Additional classes offered to inmates include GED courses, and college level correspondence courses. Offenders can also participate in bible studies and religious worship services offered through the Chaplains office. Visitation at Wake Correctional Center is by appointment only. All visits take place on Saturdays in three session 8:30am-10:30am, 12:30pm-2:30pm, and 3pm-5pm. To schedule an appointment call the facility between 9am and 4pm Monday through Friday.